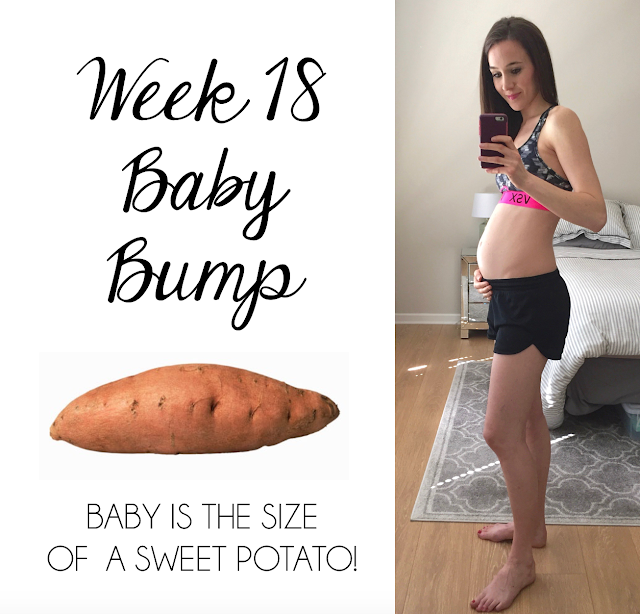 I can't believe this pregnancy is almost halfway over! I realized I'll only have 11 more updates on my blog before baby boy comes. I'm cherishing every moment. Baby is 5 3/4" long from crown to rump, not even including his legs! CRAZY! They say he's about the size of a sweet potato. They also say he is the same size as the placenta. It's hard to believe that he's so big because I haven't felt any movement since 15-16 weeks. I've tried to figure out where he is, shaking my stomach and shining my cell phone flash light on it, hoping I'll feel him move. Nothing yet! Baby boy is growing hair on his head, he has taste buds, and he can hear! I read that he might even get startled by loud noises! His organs are growing so he is sitting more upright in the womb to make space for them. About 200 of his 300 bones are present... wow! In about a 10 days at our 20 week appointment, we will have a level two ultrasound/anatomy scan to get a closer look at our little man. I can't wait to see his features and see how he is growing. We are praying for no concerns or complications. I have a feeling he is going to be one tall baby! I feel hungry all the time so I'm trying hard to eat healthy. My husband has been an awesome influence here, always making sure we have my healthy cravings on hand like watermelon, cantaloupe, honeydew, apples, oranges, yogurt, and smoothie supplies.... oh, and teddy grahams. I'm extra tired, but I have a good routine down where I take a 2 hour nap after breakfast every morning before I start my work day. It helps so much, especially when we have a lot of nights working until 11pm-midnight. Despite being tired we've made the gym more of a priority. I'll do rotations of power-walking on the treadmill, the elliptical, the stairclimber, and the spin bike. Don't get me wrong, I'm huffing and puffing after 10 minutes, but at least we're making the effort! My mood is generally pretty happy and optimistic. I'm probably in a better mood now than I was before I was pregnant... weird! Sometimes there's pelvic pain that feels like stretching mixed with a sharp shooting pain once in a while, but it's not that bad. My least favorite symptom in weeks 17-18 has been the appearance of humongous veins on my thighs. It literally looks like lumpy caterpillars crawling under my skin. Terrible visual, I know. I'm slightly mortified every time I see them. I've tried googling what this is from and every time I start reading I get grossed out and have to stop reading. I just hope my legs return to normal after baby boy is here. My husband and I are now signed up to take a 12-week class on "The Bradley Method" that starts in May and ends in August right before our due date. The Bradley Method is a method of natural childbirth without drugs that emphasizes deep breathing and the support of your partner/coach. More to come on that! We booked babymoon part I to Vancouver for a week towards the end of April! We will be staying downtown on the waterfront and plan to make day trips to Victoria and maybe Whistler. Babymoon part II will be in early June and we're planning on doing Hawaii, splitting a week between Oahu and Kauai. I'm so excited to see Pearl Harbor. We've been slowly shopping around for baby boy! We found some great deals on Zulily, at the outlets, and at a local baby resale shop. We're doing tons of research on "baby essentials." It's so hard to figure out what you actually need. We also ordered baby boy's crib so that should be arriving any day now. I will do a post soon on the baby purchases! Speaking of shopping.... we've been house shopping! We love our current place, but we're looking at all of the options we might consider in the next 1-2 years. There is a lot to learn about the San Diego real estate market before we make an investment. Baby boy still needs a name! My husband and I have been talking about baby names for a long time. We have one boy name that we both really like, but we are hoping to find at least one more strong contender to have on hand.